Do you have paper scraps lying around in your scrapbook supplies? This is a great layout to use up some of them. 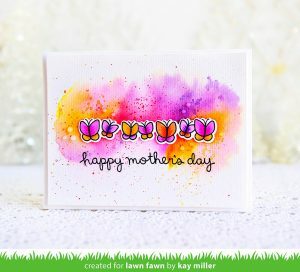 Dig deep into the bottom of your scrapbook supplies, and you will be so surprised what treasures you can come up with. This adorable page was made by Melinda Spinks from The Scrap Farm. 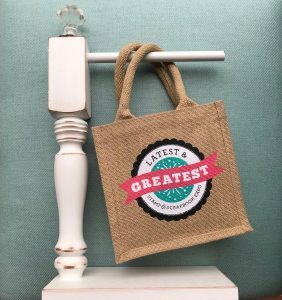 Chipboard is such a wonderful product to use that saves so much time, especially when the title work is already done for you. It is so fun to distress, paint, chalk, cover with paper or fabric, use Gelatos, or even leave it plain. This gorgeous new line “Chilled Cucumber Soup” from Jillibean Soup is a fabulous background for this layout. Flair badges are so fun to add as embellishments and Melinda used the new Fresh Style flair badges. Another fun product that Melinda used were the wood veneer pieces from Studio Calico. Look how she added some thread to give it a bit of interest to her layout. This is such a fun and simple layout. Thank you Melinda for sharing this with us as our inspiration for today. 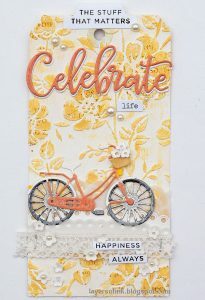 This entry was posted in New Releases, Scrapbooking and tagged chipboard, Flair Badges, greatest view, Jillibean Soup, Martha Stewart, Melinda Spinks, Studio Calico, The Crafter's Workshop, The Scrap Farm, Wooden Veneers.